In the days of the “digital divide,” Hispanics’ usage was distinguished largely by its shortfall vs. that of the general population. 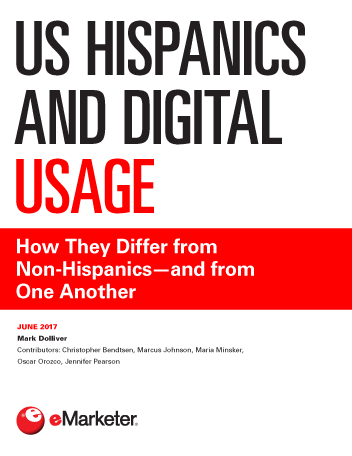 Now, while some differences in digital usage remain between Hispanics and non-Hispanics, the variations among Hispanics themselves seem to matter at least as much. Variations due to age and to the number of generations a family has been in the US tend to be the most striking. Hispanics still lag in internet penetration, but just slightly. Even among bilingual Hispanics, much usage is conducted in Spanish. A majority of third-generation Hispanics seek more online content that speaks to them as Hispanics. Hispanics were early adopters of smartphones, but the population in general has caught up. An above-average proportion of Hispanics have mobile-only internet access. As with other ethnicities, young Hispanics make more use of smartphones than their elders do. Social media penetration is slightly above average among Hispanics, though Facebook penetration is a bit below average. WhatsApp has an outsized Hispanic constituency. Even among third-generation Hispanics, social usage is important for keeping connected to Hispanic culture. Some survey data shows Hispanics making less use of the internet as a shopping tool than non-Hispanics do—especially among foreign-born Hispanics. Smartphones come into play when Hispanics seek bargains. Coupon usage (including digital coupons) is strong among Hispanics. Evidence is mixed on whether Hispanics (especially immigrants) are more receptive to ads than non-Hispanics. One survey shows third-generation Hispanics especially influenced by TV ads. Across generational lines, Hispanics want more English-language advertising that addresses their Hispanic identity. "Though US Hispanics no longer overindex as smartphone owners, the devices still have outsized importance for them."